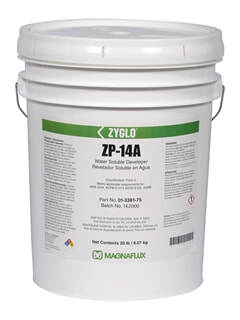 ZP-14A is a water-soluble developer for the enhancing penetrant indications during liquid penetrant inspections. It produces a uniform white porous coating when dry which is easily removed in post inspection cleaning by a water spray. Advantages include bright and highly defined indications, and can be cleaned with water. ZP-14A is listed on the QPL SAE AMS 2644 Qualified Product List.